Categorized as: Stories on March 31, 2013. 17-year-old Frances grew up in a large, Mexican-American family so stressed by kids and bills that she learned just to be silent and smile. When her mentor kept asking, she began to think she might matter to the world, more than she’d imagined. It took the support of her hiking group in the mountains of Wyoming to convince her to trust them, and herself. Read her story in her own words. Editor’s note: Frances is a junior at KIPP San José (California) Collegiate. At home, she works hard to be a role model by eagerly filling in the gaps to help support her family. She has a passion for social justice and seeks to make a positive impact on the Mexican-American community. Frances is active in her church community, where she frequently volunteers. Also an athlete, Frances plays hard on her school’s basketball and volleyball teams. My name is Frances and I live in San José, California. Three words that often come to mind when asked to describe myself are shy, reserved, and insecure. Coming from a huge family and being one of the eldest, I had to do things on my own. Even though there were challenges at home, my family has always been there to support me in reaching my goals. With a smile, my parents united the broken pieces of our family. But the financial limitations our family faced have been really hard. I wished I had a little more time and attention from my parents, because they have always been so busy helping my younger siblings and adopted nephews, dealing with school materials, meeting teachers, paying the bills, stressing about how to pay the rent, and dealing with other obligations. So, I adopted an attitude of trying not to bother anyone, keeping to myself as much as possible, and only talking about positive and cheerful things. I had a concrete mindset that everyone had their own problems and busy schedules and that I shouldn’t bother them with negative or dismaying things. I was truly convinced that nobody had time to listen or to care for how I felt and what I had gone through. Frances (with the bow in her hair) with parents and siblings at their family reunion. information. I didn’t want to open doors or talk about my life, so instead I just didn’t call or check in with my mentor. My mentor knew that this was a great opportunity for me, so instead of letting me go she would call me, leave voicemails, and talk to my teachers. This started to get to me, and I began to realize that my mentor knew I was someone of great importance. Frances with her horse at NOLS (National Outdoor Leadership School). 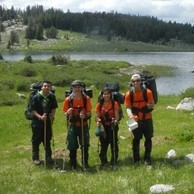 My first summer in the program, I traveled to Wyoming with National Outdoor Leadership School. I was able to hike in the beautiful Wind River Mountains and experience what it was like to share my life experiences. At first, all eleven other students in my group were so willing to open up to each other; but the most I would do was the occasional laugh. When I started sharing, it was only funny or positive things that had happened to me . . . because I didn’t want to share the bad and sad moments in my life that I had tried to completely erase from my memory. After hearing about low points in life from the kids in my group, I fully opened up. It was still a struggle for me, but having all the other students share so willingly made me comfortable and secure. I felt like a whole different person because never in a hundred years did I think I would get deep down and personal with people I had only known a few days. The family together with clergy at their church. I started talking about my family’s struggles, how it was painful to see them worry about a water bill, or how my family had to survive on beans for weeks and still have to smile at school and pretend we were okay. These talks brought the group closer—every single time. It was truly a motivating and an awe-inspiring experience. As I learned on my 28-day course in Wyoming, it is only human to want to learn more about a person by talking to them about their life experiences, whether they be good or bad. Coming back from this course I began to analyze relationships and communication. I am tremendously grateful for gaining confidence and realizing how important sharing myself is. Now I can experience building long-term relationships that will last a lifetime because of the simple fact that I know this: Allowing people to step into your bubble can and does build stronger relationships. I really enjoyed this great opportunity given to me with the help of Summer Search. Fellow sponsors and our donors actually believe that teens are the future of tomorrow, and that we can take up those roles by gaining leadership skills to lead our nation to success. Just another fierce hoopster on the high school basketball team. DONATE directly to give more students like Frances a chance at college. Click here. Photographs courtesy of Frances and Summer Search Silicon Valley.